Cook pasta per instructions on the box. While pasta water is boiling, in a large pan, melt butter over medium heat. Add garlic and saute until lightly browned. Add shrimp, and cook 1-2 minutes. Add lemon juice, lemon zest, and oregano. 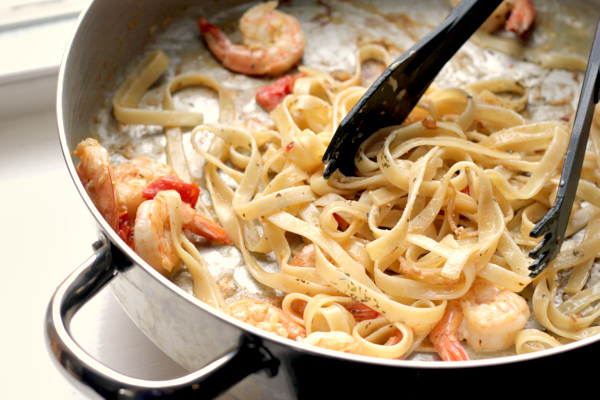 Cook for addition 2-3 minutes (until shrimp turn pink), and then lower heat and gently stir in desired amount of cream. Add black pepper and additional oregano to taste. Remove sauce from heat and add cooked/drained pasta noodles to pan. Stir until combined and serve.